This $1.278 billion project for the Los Angeles Metropolitan Transportation Authority (Metro), being built by a joint venture of Walsh and Shea, is an 8.5-mile light-rail line that will run between the Expo Line on Exposition Boulevard and the Metro Green Line. NTP was issued in September 2013 with revenue service expected by October 2019. 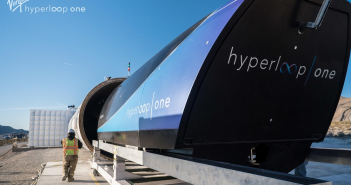 The project consists of twin bore tunnels, about 1-mile long each, connecting three underground stations. The tunnel is 21-ft OD (19-ft ID) and is approximately 70 ft below ground. Ground conditions are soft ground/alluvial, leading to the choice of an EPB TBM. Construction of the concrete inverts and emergency walkways in both tunnels are complete, as is final concrete lining of all five cross passages. The primary activities remaining to be completed in the tunnels are the construction of the trackwork and concrete plinths throughout, and final outfitting/installation of mechanical and electrical systems. Parties affiliated with the project: TBM Manufacturer – Herrenknecht (Germany); Consultants: HNTB; Construction Support Services: Stantec; Tunnel Engineering: Arup; Systems: L.K. Comstock; Structural Engineering: SC Solutions; Community Outreach: Los Angeles Urban League; Civil Engineering: Jenkins/Gales & Martinez; Electrical: Neal Electric; Quality Control: QEI; Survey: Psomas. Key Project Personnel – Deputy Executive Officer, Project Director (Metro): Charles H. Beauvoir; Interim DEO, Deputy Project Director (Metro): Kimberly Ong; RE (Metro): Dana Rogers; Project Manager (WSCC): Jim Gardner; Deputy Project Manager (WSCC): Dave Preston; Construction Manager (WSCC): Carl Christensen. The scope of work includes 17,900 ft of twin-bore tunnel: Reach 1 is 9,600 lf between Wilshire/La Brea Station and Wilshire/Western TBM retrieval shaft; Reach 2 is 4,400 lf between Wilshire/La Brea and Wilshire/Fairfax Stations; and Reach 3 is 3,300 lf between Wilshire/ Fairfax and Wilshire/La Cienega Stations. There is also 600 lf of tail track to the west of Wilshire/ La Cienega Station where the TBMs will be buried. The tunnel is 18-ft, 10-in. inside diameter with 12-in. thick precast concrete lining. Depth varies from 40 ft and 100 ft. The alignment includes three stations and the western retrieval shaft and 23 cross passages. Tunnels are planned to be mined by two Herrenknecht EPBMs. Cross-passages are planned to be mined by the sequential excavation method using variety of localized ground support systems. Anticipated ground conditions include: Soft ground consisting of Pleistocene-age (San-Pedro) and Pliocene-age (Fernando) formations; Some alluvium deposits and artificial fill areas above the tunnel; Tar sands comprise almost 25% of tunnel alignment; Expected water table up to 90 lf above tunnel crown; Presence of methane (CH4) and hydrogen sulfide (H2S) gases (tunnels are deemed “gassy” by OSHA). The project is 15% complete. Production of tunnel precast concrete Liners began in November 2016. TBM manufacturer Herrenknecht has completed manufacture of the two TBMs, and the functionality tests were successfully conducted at the Herrenknecht factory in July. 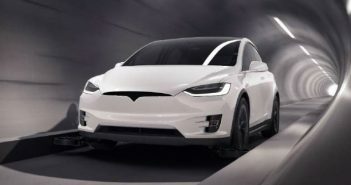 Delivery to LA is scheduled in November. Jet grouting of cross-passages began in November 2016. Wilshire/ La Brea Station excavation (tunnel launch point) began in July 2016. Tunnel Designer: PTG/CH2M (for STS JV); Construction Manager: WEST JV (Stantec/Jacobs). Engineering/AECOM); Major Subcontractors – TBM Manufacturer: Herrenknecht; Precast: Traylor precast; Support of Excavation/piles: Condon Johnson; Jet Grouting: Malcolm Drilling; Geotechnical instrumentation: Group Delta; Dewatering: Moretrench; Standpipe: Link Nielsen. Key Project Personnel: James Cohen, Executive Officer, Program Management LACMTA; Ashok Kothari, Project Director, WSP/Parsons Brinckerhoff; (Skanska) Mike Aparicio, Mike Smithson; (Traylor) John McDonald, Matt Burdick, Richard McLane; (Shea) Jim Marquart, Jim Honeycutt. The Los Angeles County Metropolitan Transportation Authority (Metro) Board of Directors on Jan. 26, 2017, awarded a $1.37-billion contract to the joint venture team of Tutor Perini/O & G to build the second section of the Metro Purple Line Extension Project to Century City. The Board also established a budget of $2.4 billion for the project. Completion of the second subway section is anticipated no later than 2026. The second section will add another 2.6 miles to the Purple Line with one station at Wilshire/Rodeo in downtown Beverly Hills and a station in the heart of Century City. The tunneling portion of the $1.75 billion Regional Connector Transit Project for the Los Angeles County Metropolitan Transportation Authority involves 5,795 ft of twin tunnels with an excavated diameter of 21 ft. NTP was issued July 7, 2014 with a forecast completion date of December 2021. The ground conditions range from alluvium soils to siltstone of the Fernando formation, with the potential for methane, hydrogen sulfide gas, and boulders. The groundwater table is generally above the tunnel alignment. Pressure balance tunneling utilizing an EPB TBM is required, along with precast concrete segments with double gaskets as the tunnel lining system. The tunnel depth (cover) ranges from 25 ft to approximately 120 ft and crosses below the existing Metro Red Line heavy rail tunnels with less than 7 ft of clearance. The Regional Connector includes approximately 2,100 ft of cut-and-cover and retained cut guideway, a 300-ft crossover cavern excavated by SEM techniques, and three cut-and-cover subway stations. The bored tunnels will be excavated concurrently with the three station construction, requiring coordination of cut-and-cover and tunnel excavation. The Little Tokyo/Arts District Station, located at 1st St & Alameda St, excavation and invert concrete was completed in December 2016 and TBM tunneling commenced in February 2017, and the first tunnel was completed on July 19, 2017. The TBM was moved and relaunched on Sept. 26, 2017, at the 1st St & Alameda St station box for excavation of the second drive of which 4,743 ft has been excavated through Dec. 28, 2017. On Nov. 7, 2017, the tunneling crews set a tunnel production record of 190 ft in one 24-hour day. The second bore successfully crossed underneath the existing Red Line tunnels under Hill Street. The TBM was relaunched in the Grand Av Arts/Bunker Hill Station and is currently completing the last 1,000 ft of tunnel drive to the Flower Street cut-and-cover section where the TBM was expected to be demobilized in mid-January 2018. The excavation of the 90-ft deep Historic Broadway Station, located at 2nd St and Broadway, is approximately 60% complete waiting on the completion of the second tunnel drive. Other parties affiliated with the project – Tunnel Designer for the Contractor: Mott McDonald; Metro’s Construction Management Consultant: Arcadis; TBM Manufacturer: Herrenkecht. Preliminary design was completed by CPJV (AECOM/ WSP), which is also performing design services during construction. Key Project Personnel – Metro Project Executives: Gary Baker, Project Manager; Michael Harrington, Engineering Manager; Mat Antonelli, Construction Manager; Metro Design Consultants: (AECOM/WSP), Bill Hansmire, Tunnel Design Manger; Metro Construction Manger Consultants: (Arcadis), Patrick Jolly, Construction Manager; Ron Drake, Technical Advisor/Tunnel Resident Engineer; Contractor Project Executives (Regional Connector Contractors RCC): (Skanska) Mike Aparicio, Mike Smithson; (Traylor) John McDonald, Richard McLane, Christophe Bragard. This $279.4 million contract for Hartford Metropolitan District (MDC) includes the construction of an 18-ft finished (lined) diameter tunnel 21,800 ft in length in deep rock (~200 ft deep), launch shaft and retrieval shaft, as well as pump station excavation shaft, drop shafts, adits, de-aeration chambers and odor control at potential release points. The launch shaft is to be excavated at 38 ft diameter, the retrieval shaft at 33 ft diameter, and the pump station shaft at 74 ft diameter. The drop shaft diameters vary from 42 to 72 in. The tunnel is expected to be operational by 2023. TBM: Herrenknecht; Engineer: AECOM; Construction Manager: Jacobs; Clean Water Project Program Manager: CDM Smith. This $254.9 million project for DC Water is substantially complete with final completion scheduled by March 13, 2018. As of Jan. 2, the project was 98% complete by schedule. The TBM drive was completed Nov. 5, 2016. During its drive, the TBM crossed under the Anacostia River, several fragile utility lines and several freeways without damage. Only minor concrete and site restoration work are left to complete. Most of project personnel will be moving to the follow-on Division J Northeast Boundary Tunnel (NEBT) project. The TBM arrives in March/April 2018. The Anacostia River Tunnel was delivered using design-build and featured the extensive use of slurry walls, and included depressurizations of lower artesian aquifer while leaving upper aquifer undisturbed. The TBM advance used conveyor belt system through multiple curves with a vertical belt storage unit exterior to the shaft. Other unique features included: steel fiber precast segmental lining; extensive use of geotechnical instruments for monitoring TBM excavation performance; and use of compensation grouting to cross under fragile critical utilities. Designer: Parsons Professional Corp.; Construction Manager: Gilbane; Major Subcontractors: Moretrench, Con-Seg, Bulldog Construction, SECA, Kelly Electric, Hess Mechanical. TBM Manufacturer: Herrenknecht. Conveyor Manufacturer: H+E. Key Project Personnel – Project Manager: Shane Yanagisawa, Deputy Project Manager: Phil Colton, Construction Manager: Andrea Sessena, Quality Manager: Rick Munzer, Business Manager: Ale Meillon, Design Manager: Jonathan Taylor, General Superintendent: Garry Horner, Equipment Manager: Chuck Tedford, Electrical Superintendent: Bruce Haught, Concrete Superintendents: Jimmy Hill, Robb Brunner, Stuart Casasola, Tom Alexander, Senior Concrete Engineer: Andy Wolterman, Construction Manager: Scott Shylanski. Information: John Kennedy, (702) 524-0438. DC Water issued NTP for the $580 million Northeast Boundary Tunnel in December 2017. The NEBT is the largest component of DC Water’s Clean Rivers Project. The soft ground tunnel will be 23-ft in diameter, constructed with precast concrete segments, approximately 50-to 160-ft below the ground surface. Diversion facilities will be constructed to capture flows from the existing sewer system and divert them into the tunnel. In addition to the tunnel and diversion facilities, the NEBT will include construction of ventilation control facilities, stormwater inlets and green infrastructure. Brierley Associates is the Engineer-of-Record for the Design/Build team. Subconsultants to Brierley Associates are: Aldea Services, LLC; Concrete Consultants Group, LLC; DLZ Corporation; EBA Engineering, Inc.; Kroner Environmental Services, Inc.; Subsurface & Tunnel Engineering, LLC; and Tunnelconsult Engineering SL. Project completion is scheduled for 2023. The City of Atlanta Department of Watershed Management is converting a more than 100-year-old quarry into a 2.4 billion-gallon raw water storage facility. The system consists of a deep hard rock tunnel, two deep pump stations, two dropshafts and multiple connecting adits and shafts. Bored with a Robbins TBM from tunnel portal at the quarry base, the tunnel is approximately 24,000 ft long, 250 to 450 ft deep, 13 ft in bore diameter, and is partially concrete lined with modified contact grouting to control water infiltration/exfiltration. The project is being delivered via a Construction Management at Risk (CMAR) mechanism. The program design will address the objectives of achieving 100 years of asset lifecycle and flexibility in system operations. The estimated cost of design and construction for conveyance and water storage is approximately $300 million. As of Jan. 2, 2018, the TBM was at Station 120+55 which is slightly over halfway. The deep pump station shafts have been completed. Four of the five blind-bored shafts, to a depth of approximately 425 ft, have been completed. Project completion is scheduled for September 2019. Stantec is the engineer of record for design of shafts and tunnels. This $107.7 million project for the Metropolitan Water Resources District (MWRD) includes approximately 5,800 ft of 20-ft ID tunnel with two shafts (one permanent and one for construction to be abandoned at completion of work). Entire tunnel is in dolomite limestone and is being constructed via drill-and-blast methods. Tunneling is nearing completion and lining has begun. The tunnel has two live connections, one on each end. On one end it will connect to the terminus of MWRD’s existing Des Plaines Tunnel system and on the other it will connect to the live McCook Reservoir, which was scheduled to go online in December. MWRD cannot shut down either the tunnel or the reservoir to accommodate the connections so all work will be heavily weather dependent. NTP was issued on July 9, 2016. Completion is scheduled by Jan. 23, 2020. The designer is Black & Veatch. Key Project Personnel – MWRD: Kevin Fitzpatrick, Carmen Scalise, Patrick Jensen. Walsh: Brian Fidoruk, Nick Simmons. B&V: Mark White, Cary Hirner. This $188 million project for the City of Fort Wayne – City Utilities consists of 24,500 lf of tunnel, 16 ft ID, segmentally lined, excavated with slurry TBM at a depth of approximately 200 ft. Starter and tail tunnel construction are being built by drill-blast method. There are three large-diameter shafts (between 28 and 70 ft diameter) supported with slurry walls through overburden and excavated through rock with drill-blast. There are 13 small-diameter (4 to 10 ft diameter) shafts excavated with blind drill method. The alignment crosses through limestone of the Wabash Formation with anticipated high groundwater inflow in the range of 5,000 gpm to 10,000 gpm at 6.5 bar pressure. The Contract Award was April 26, 2017. NTP was issued May 1, 2017, with site work starting immediately thereafter. TBM mobilization is expected around May 2018. Substantial completion will be around August 2021. Tunnel Designer: Black & Veatch; Construction Manager: CH2M. Key Project Personnel: Owner/City of Ft Wayne: Mark Gensic, TJ Short; Tunnel Designer: Black & Veatch: Leo Gentile (Senior Project Manager), Matthew Pierce (Project Manager); Construction Manager: CH2M: Glen Adams (Regional Construction Manager); Contractor: Salini-Impregilo/Healy JV: John Kennedy (Project Director); Manfred Lechner (Project Manager); Claudio Cimiotti (Construction Manager); Lance Waddell (Chief Engineer). Information: John Kennedy at jkennedy@sahealy.com or 702-524-0438. The Deep Rock Tunnel Connector is a 42,000-ft, 20-ft, 2-in. diameter bored tunnel with an 18-ft finished concrete lining (approximately 250 ft deep). There are two bifurcations in the final alignment and three CSO connecting structures/deaeration chambers and adits. The Eagle Creek Deep Tunnel is a 9,175-ft, 20-ft, 2-in. bored tunnel with an 18-ft finished concrete lining. Total contract value for both segments is approximately $220 million. The work is for Citizens Energy Group’s DigIndy project, which is a CSO reduction program including six deep rock tunnels totaling over 28 miles. The project achieved Substantial Completion in mid-December 2017, and the system began accepting CSO flow near the end of December 2017. Key Project Personnel – Construction PM: Christian Heinz, P.E. ; Assistant Project Manager/Project Engineer: Percy Townsend; Safety Manager: Kyle Shickles; Equipment Superintendent: Keith Walter; Field Engineers: Eric Haacke, Zack Heinrich, Kendall Gadd, Chris Monahan, Max Engen. Inspection PM: Alex Varas, P.E. (AECOM), Assistant PM: Mark Guay (AECOM). Owner: Citizens Energy Group – Manager of Construction: Mike Miller, P.E. ; Supervisor Special Projects: Tim Shutters; Construction Supervisor: John Morgan. The White River Tunnel is a 30,600-ft, 20-ft, 2-in. diameter bored tunnel with an 18-ft finished concrete lining (approximately 250 ft deep). There are two bifurcations in the final alignment and seven CSO connecting structures/deaeration chambers and adits. The Lower Pogues Run Tunnel is a 10,200-ft, 20-ft, 2-in. bored tunnel with an 18-ft finished concrete lining, which bifurcates from the White River Tunnel alignment, and includes two CSO connecting structures/deaeration chambers and adits. The work is for Citizens Energy Group’s DigIndy project, which is a CSO reduction program including six deep rock tunnels totaling over 28 miles. Mining commenced in September 2016 from a 35-ft diameter shaft that was previously constructed as the retrieval shaft for the Deep Rock Tunnel Connector alignment. 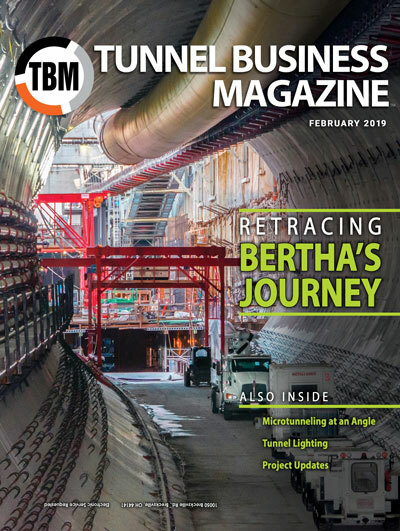 As of December 2017, mining of the White River Tunnel alignment extended approximately 4,800 ft, at which point the TBM turned into the Lower Pogues Run Tunnel alignment, where it completed mining of the 10,200-foot alignment. As of December 2017, the contractor is backing the TBM down to the bifurcation, and will then relaunch underground continuing on with the remainder of the White River Tunnel. Based on the terms of a federal consent decree, the White River and Lower Pogues Run tunnels must be operational by the end of 2021. Inspection PM: Sam Cain, P.E. (AECOM). This $106.7 million project for the Louisville Metropolitan Sewer District includes 14,450 lf of 20-ft finished diameter tunnel, 200 to 210 ft to tunnel invert, three construction shafts – 40-ft to 25-ft finished diameter, three vortex drop shafts and one baffle drop shaft (retrieval shaft). Granular outwash soils over limestone and dolomite bedrock, secant pile initial support for construction shafts, open main beam TBM for excavating tunnel capable of backing up through excavated tunnel. The project has just begun. Contractor is mobilizing and beginning shaft sinking operations. The project will include full diameter tunnel bifurcation requiring TBM backup, and upper end of tunnel is a baffle drop shaft. Other Major Parties Affiliated with the Project: Tunnel Designer – Black & Veatch, Construction Manager – Black & Veatch, Pump Station Designer – HDR, Geotechnical Investigation – 7NT, Structural Engineers – Cornerstone, Robbins Main Beam TBM Refurbished by Shea with a new Robbins cutterhead. Work for this $27 million project for the City of St. Joseph Department of Public Works generally consists of the construction of 90-in. diameter concrete precast segment lined 6,648-ft long tunnel, 37-ft diameter baffle drop shaft, 48 ft of near surface reinforced concrete box culvert, 2-ft diameter vent shaft, 181 ft of 90-in. diameter open-cut steel pipe installation, 125 ft of 90-in. jacked steel pipe, an energy dissipation structure, site restoration, and performance of other associated works. The project is still in the early stages. Mobilization is continuing through the end of the winter. Super Excavators has installed steel sheeting for the energy dissipation shaft and began excavation. Secants for the tunneling launch shaft (48-ft diameter) have been installed, and the shaft will be excavated in the coming weeks. The crew is currently setting up to begin a bore beneath existing rail road tracks which will ultimately act as the tail tunnel. The EPB TBM is being produced in China, and is in the final stages of manufacturing as crews prepare for final TBM testing. The TBM is expected to arrive in the United States in early April 2018. Tunneling is expected to commence in late spring 2018. It is the first EPB machine provided by Lovsuns in the United States. Black & Veatch is the designer. Notice to proceed was issued on July 17, 2017. Scheduled Completion is October 2019. Key Project Personnel: Mike Garbeth, Project Manager, Super Excavators; Gregg Rehak, Vice President, Super Excavators. The Deer Creek Sanitary Tunnel, part of Metropolitan St. Louis Sewer District’s (MSD) Project Clear, is an $147 million job comprising 21,000 ft of 19-ft diameter tunnel. The project was awarded to SAK Construction on Aug. 10, 2017, after nearly a year in delay as the initial bid was contested. The ground cover over the tunnel alignment will vary in depth between approximately 85 and 170 ft. In general, the tunnel alignment will pass through limestone/dolomite of the St. Louis and Salem Formations. The tunnel’s final liner will be unreinforced cast in–place (CIP) concrete at least 1-ft thick. 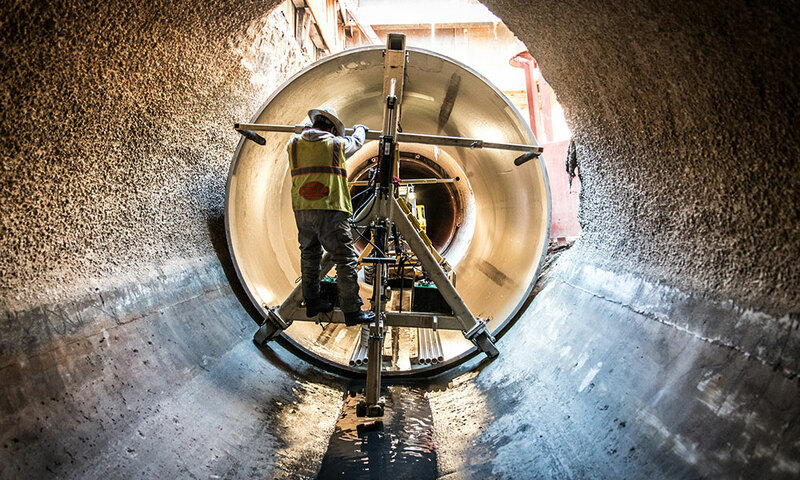 The Jefferson Barracks Tunnel, part of Metropolitan St. Louis Sewer District’s (MSD) Project Clear, is an $67 million job comprising 17,800 ft of tunnel lined with 7-ft diameter fiberglass pressure pipe. The Jefferson Barracks Tunnel will be built by TBM 150 to 230 ft deep in limestone. Additional work includes the construction of a 90-ft deep launch shaft and an 18-ft diameter recovery shaft. Jacobs Engineering is the designer. The Maline Creek CSO Storage Facility project, part of Metropolitan St. Louis Sewer District’s (MSD) Project Clear, is an $82.8 million job comprising an underground storage facility. The facility’s major works include a 175-ft deep, 40-ft diameter shaft, a 2,700-ft long, 28-ft diameter drill-and-blast tunnel, and three intake structures. NTP was issued in May 2016 and blasting operations began in October 2016. Blasting of the shaft was completed in March 2017, with blasting for the tunneling expected to continue through late spring 2018. Shaft drilling work for all of the intake structures was completed prior to spring 2017. Construction of the Chain of Rocks Drive intake will last through spring 2018 and the construction of the Church Drive intake structure will last through winter 2018. Construction of the pump station will continue through fall 2020. Jacobs Engineering is the designer. The New York City Department of Environmental Protection (DEP) continues to work on its Delaware Aqueduct bypass tunnel project to address two leaking sections from the aqueduct. The $101 million BT-1 contract comprises two shafts on either side of the river. Shaft 5B (in Newburgh), a 30-ft finished diameter, 838-ft deep structure, and Shaft 6B (in Wappingers), a 33-ft finished diameter, 673-ft deep structure, were both completed under a separate contract (BT-1) by Schiavone Construction Co.
Contract BT-2 is a $706 million contract construction a 2.5-mile long, 22-ft diameter bypass tunnel using a $30 million Robbins TBM to build a new bypass tunnel to replace the leaking portion. The entire machine — including its cutterhead, body and trailing gear — is more than 470 ft long and weighs 2.7 million lbs. Its cutterhead is 21.6 ft in diameter. The TBM was built to withstand 30 bar of pressure—believed to be the most of any TBM ever manufactured. The TBM is also equipped with dewatering equipment to pump 2,500 gallons per minute away from the tunnel as the machine drives it. In March, TBM manufacturing was completed by Robbins at its Solon, Ohio, shop. On Sept. 8, DEP held a ceremony at the jobsite to commemorate the start of tunneling activities. Over the next four months, crews will complete the process of assembling and launching the TBM. The Suffolk County (NY) DPW in January 2018 accepted a $187.78 million bid to construct a new outfall pipe, which will extend 14,000 ft from the Bergen Point Waste Treatment Plant to an outfall structure in the Atlantic Ocean. The tunnel will be 12-ft ID. CDM Smith is the designer. Gall Zeidler provided geotechnical subconsultant services. This $184M project for the City of Akron, part of $1.4 billion CSO program, involves 6,240 ft of 27-ft diameter tunnel. Crews are using a Robbins Crossover TBM, a U.S. first, to build the tunnel. The TBM began boring in August. As of Thanksgiving, crews were preparing to convert the machine from soft-ground configuration to hard rock configuration to complete the majority of drive in hard-rock mode. Completion is set for Dec. 31, 2018. Turn-Key Tunneling has been contracted by McNally Tunneling Corp. to complete a 42-in. connection adit to service the main 90-in. Dugway South Relief and Consolidation Sewer for the Northeast Ohio Regional Sewer District (NEORSD). Though initially designed to be installed with a hand mine tunnel, Turn-Key elected to complete the tunnel using a hard rock SBU cutting head and auger bore machine. Due to the dense population surrounding the work site, work will be competed out of a 20-ft diameter working shaft. Turn-Key Tunneling began installing a tail tunnel for the larger bore machine needed for the project shortly before the holidays. Boring is set to begin shortly after the new year with project completion projected by the end of January. Information: Joel Froehlich, Project Manager, joel@tunnelit.net. Turn-Key Tunneling was subcontracted to complete four hand-mined tunnels out of two separate access shafts by Salini-Impregilo/Healy JV on the Dugway Storage Tunnel Project for the NEORSD. Each of the tunnels exited the shafts at different elevations which required scheduling the tunnels in sequence with the vertical shaft excavations. Three of the tunnels are to be 114-in. in diameter and the fourth is 84-in. in diameter. To date, one 114-in. and the 84-in. tunnels have been completed and excavation of the third tunnel began on Jan. 8. The 84-in. was mined to a buried 48-in. RCP with a poured in place bulkhead over the end that had to be carefully removed before the new 48-in. could be installed to connect to the existing. The poured-in-place bulkhead, #57 gravel, high water table and other backfill materials made for extremely challenging geology. Brian Froehlich, P.E. – Project Engineer, brian@tunnelit.net. Turn-Key Tunneling was contracted by NEORSD to perform a design-build project to rehabilitate a failed 11-ft diameter storm sewer for the Emerald Parkway Culvert Rehabilitation Project. The Invitation to Bid included 30% design drawings from which the project was to be fully designed and constructed. The project includes an 80-ft deep, 24-ft diameter access shaft, 240 lf of 132-in. tunnel, two auger bores, bypass pumping, pipe cleanout and Hobas slip lining along with other site restorations. To date, the shaft has been completed, and the first bore for a gravity flow bypass is underway. NTH Consultants was subcontracted by Turn-Key Tunneling to provide the design drawings and specifications for the project. Information: Brian Froehlich, P.E., Project Engineer, brian@tunnelit.net; Ryan Butler, P.E., Design Engineer, rbutler@nthconsultants.com. Blacklick Constructors is building the 10 ft. ID Blacklick Creek Sanitary Interceptor Sewer approximately 23,000 ft. in length with 40 to 140 ft. of cover. The segmentally lined tunnel is being excavated using a Herrenknecht EPBM. A short section of the alignment was constructed by open-cut prior to the launch of the machine. The tunnel is lined using a 4-ft long, bolted & gasketed precast concrete tunnel liner. The project includes 12 shafts, hydraulic drop structures, a passive odor control vault and appurtenances. NTP was issued in May 2016 with completion anticipated by July 2020. Tunneling is 46% complete with approx. 2,300 lf of soft ground excavation left before transitioning into the rock portion of the alignment. All the intermediate shafts have been completed and excavation of the TBM retrieval shaft is ongoing. The TBM is expected to encounter rapidly varying glacial and alluvial materials, tills, boulders, sand, fill and shale; a hydraulic conductivity up to 10-1 is expected in the soft ground portions of the alignment. Key Project Personnel: Ed Whitman, Project Manager; Ron Klinghagen, General Superintendent; Ehsan Alavi, Ph.D., Project Engineer; Peter DeKrom, Survey Manager; Superintendents, Engineers, and Safety: Joel Sostre, Mike Stucky, Jessica Hirashima, Amanda Kerr, Max Ross, Nick Farrington. This emergency project for the Ohio Department of Transportation (ODOT) involved the reconstruction of a rapidly failing 84-in. CMP culvert which threatened numerous local businesses and a critical four-lane expressway in Southern Ohio. The project was multi-faceted in that a vertical shaft was needed to provide a safe working environment 30-ft deep to make the necessary repairs to the collapsed storm sewer. The vertical shaft was further needed due to the proximity of the four-lane expressway and frontage road. ODOT elected to have the culvert collapsed sections repaired with new 84-in. liner plate using traditional hand mining techniques while simultaneously removing the failed culvert. Once the new tunnel portion was installed, the entire portion of the culvert owned by ODOT received a paved invert. A new manhole was constructed and placed in the working shaft, allowing for future access to the newly constructed portion of the pipe. Lastly, the downstream headwall area was dressed with a concrete cap to prevent further soil erosion of the steep embankment. Information: Joel Froehlich, Project Manager, joel@tunnelit.net. The Toledo Waterways Initiative (TWI) program for the City of Toledo encompasses more than 45 separate projects over the course of 18 years, at a total estimated cost of $527 million. As part of Phase II of the project, Turn-Key Tunneling will be constructing a 715-ft long rib-and-board tunnel utilizing a hydraulically driven tunnel shield. The 12-ft diameter tunnel will be the initial pass for the two-pass tunnel system and act as the final host for the 108-in. sanitary sewer. Turn-Key Tunneling will also be constructing a 32-ft diameter shaft for a future junction chamber which will serve as the reception shaft for the shield removal. The tunnel is to be installed in lean clay directly adjacent to a river. Work is slated to begin on the tunnel in mid-February. Information: Joel Froehlich, Project Manager, joel@tunnelit.net. This $33.4 million project for the Renewable Water Resources (RE-WA) comprises 6,000 lf of 130-in. ID rock tunnel with 84-in. carrier pipe (Hobas CCFRPM pipe) grouted in place. The Tunnel depth ranges from 40 to 130 ft below ground surface. Also included is a 40-ft ID by 40 ft deep launch shaft and 30-ft ID by 130 ft deep receiving shaft. The tunnel is to be mined in intact gneiss bedrock using a double shielded rock gripper TBM manufactured by Lovsuns. The shaft construction consists of liner plate and rock dowels with wire mesh. The project also includes 1,600 lf of 60- and 42-in. upstream and downstream connecting sewer as well as several junction chambers, screening/diversions structures and odor control facilities. The Notice to Proceed is expected to occur March 5, 2018. Completion is expected by June 26, 2020. Tunnel Designer /Construction Manager – Black & Veatch; TBM Manufacturer – LOVSUNS Canada. Major Subcontractors and Suppliers – Chardon Concrete (Concrete Structures), Pacific International Grout (Cellular Grout), Tunnel Carrier Pipe (Hobas Pipe). Key Project Personnel: Joe Mulville – Senior Project Manager, Super Excavators/CMCRA JV; Greg Rehak – Vice President, Super Excavators; Stephen O’Connell – Construction Manager, Black & Veatch; Jason Gillespie – Senior Project Manager, Renewable Water Resources. The Parallel Thimble Shoal Tunnel is part of the overall Chesapeake Bay Bridge and Tunnel, a 20-mile-long vehicular toll crossing of the lower Chesapeake Bay. This facility carries US Route 13, the main north-south highway on Virginia’s Eastern Shore, and provides the only direct link between Virginia Beach and the South Hampton Roads, Virginia. The crossing consists of a series of four lane low-level trestles and bridges which are connected by two approximately one-mile-long two-lane tunnels beneath the Thimble Shoal and the Chesapeake navigation channels. The Parallel Thimble Shoal Tunnel will be approximately 5,700 lf, 42-ft OD and is being procured through a design-build contract, awarded in 2016 to a Dragados–Schiavone JV. The project is aimed to improve the level of service and safety along the current crossing, allow for more open lanes during ordinary maintenance and provide an alternate route in the event of an accident in the existing tunnel. The JV submitted the lowest price proposal at $755,987,318. The JV has proposed to construct a bored tunnel for the new Parallel Thimble Shoal Tunnel. Construction will begin on Island 1 with the construction of a large pit. The tunnel boring machine (TBM) will be delivered to the site in several large pieces and will be assembled in the bottom of the excavated pit. After assembly of the Herrenknecht TBM, construction of the tunnel will begin. A groundbreaking ceremony was held in September 2017. Construction duration is anticipated for 3.5 years. This is a $121 million project as part of Seattle Sound Transit’s East Link light rail extension project. The tunnel consists of 1,985 lf of ovaloid tunnel, approximately 34-ft ID, 12 to 48 ft deep. In addition to the tunnel, there is one maintenance shaft (17-ft diameter, 50-ft deep) located near the midpoint of the tunnel, a connecting adit to enlarged tunnel section for permanent ventilation fans, and 250 lf of cut-and-cover structure. Crews are excavating soft ground consisting of glacial till and outwash gravel, using sequential excavation method (SEM) including full top heading (three headings) as well as single side drift (6 headings). NTP was issued in Feb. 2016 with substantial completion planned for May 2020. Crews have completed excavation and support of first 54% using full top heading, bench and invert, currently excavating and supporting using single side drift. Construction of mid-tunnel maintenance shaft and adit is scheduled to start spring of 2018. Crews are utilizing two Liebherr 950 to excavate the tunnel, and Normet Spraymec 8100 shotcrete robot to place the shotcrete lining. HDR/McMillen Jacobs Associates are the Construction Manager and Resident Engineer. Mott McDonald is the Tunnel Designer. Guy F Atkinson is the Contractor with GZ Consulting as the SEM Tunnel Engineer. Key Project Personnel – Sound Transit: Chad Frederick, Principal Construction Manager; Blake Jones/Ryan Lescouflair, Community Outreach. Atkinson: Archie Kollmorgen, Project Manager; Jake Coibion, Tunnel Manager. McMillen Jacobs Associates: Ted DePooter, Resident Engineer; Mun Wei Leong, Office Engineer. To build the O-Train Confederation Line, the City of Ottawa assembled a strong public-private partnership that includes financial commitments from the provincial and federal governments, and a proven private-sector project team, the Rideau Transit Group. A world-class consortium of Canadian and international companies, the Rideau Transit Group was selected in a highly competitive process based on the strength of the group’s design, construction and financial proposal, and its track record of delivering major transportation projects on time and on budget. Working closely with the City of Ottawa, the Rideau Transit Group designed and began building the $2.1 billion Confederation Line in 2013 and will maintain the line until 2038. Revenue Service begins when the build is completed in 2018. An integral part of the Rideau Transit Group (RTG) proposal for the Confederation Line was the approach to the construction of the tunnel under Ottawa’s downtown core. The tunnel spans 2.5 km, is on average 15 m below the surface and features three of the stations in the Confederation Line project — Lyon, Parliament and Rideau. Following the bid process in 2012, the City’s experts from around the world worked to determine the tunneling method and equipment required for the Confederation Line tunnel. Proximity to the Rideau Canal, a UNESCO World Heritage Site, the specific soil conditions of the downtown core, and the properties of the geotechnical materials to be excavated were all evaluated. It was also important that the tunneling method minimize disruptions for the general public and daily life in the city. Sequential Excavation Method (SEM) was used to mine the tunnel. SEM provides a high degree of flexibility to adjust the excavation approach and support measures for soil and rock conditions encountered; it also reduces risks of tunneling construction. This method also minimizes longer term disruptions at surface. Major Milestones include: Q4 2016 – The first light rail vehicle assembled in Ottawa was tested on the track between Blair and Cyrville stations; Q1 2017 – Tunnel excavation completed; Q3 2017 – Overhead Catenary System installed and powered between Tremblay and uOttawa; Q3 2017 – Train testing on the eastern section of the track; Q4 2017 – 20 LRVs assembled, 4 more on the assembly floor (of 34 planned vehicles). Current construction activities include track work and finish work on stations. Trackwork teams are focused on completing trackwork at the East Portal, the West Portal, around Parliament Station and up to Rideau Station. In the West, crews are tamping a west-bound section of track near Pimisi Station while rail installation is currently taking place at Tunney’s Pasture. Train testing is ongoing on the eastern stretch of the alignment. State-of-the-art mining techniques helped minimize impacts on residents and businesses. Using the sequential excavation method has meant that only three access points are required, drastically minimizing closures and detours. Using smaller, quieter roadheaders to dig the tunnel, instead of a large tunnel boring machine, greatly limited noise and vibration for surrounding buildings. Much of the work on the tunnel is happening 15 m below the surface with little sign of what is happening below at street level. Rideau Transit Group equity partners are: ACS Infrastructure Canada Inc., SNC-Lavalin and EllisDon. DBJV is made up of: Dragados Canada Inc., EllisDon and SNC-Lavalin. Some of the other firms that have worked on the project include: Thurber Engineering Ltd. (geotechnical); Dr. Sauer & Partners Corporation (tunnel design); Adamson & Associates Architects (station design); Alstom – vehicle; Thales – systems; bbb Architects (station design); Fast + Epp; Hatch Mott MacDonald; IBI Group; MMM Group; Sereca Fire Consulting Ltd.; and Scotia Capital. Key Project Personnel – City of Ottawa/O-Train Construction Office: John Manconi, General Manager, Transportation Services; Steve Cripps, Director, O-Train Construction; Gary Craig, Manager, Light Rail Design and Construction. Rideau Transit Group/OLRTC: Antonio Estrada, CEO, Rideau Transit Group; Peter Lauch, Technical Director, Rideau Transit Group; Eugene Creamer, OLRTC Project Director; Humberto Ferrer, OLRTC Deputy Project Director.